The Most Advanced Tongkat Ali Extract Available! HPLC analyzation during the extraction phase ensures that the extract contains at least 2.4% eurycomanone, which proves not only that it's potent but also that it's a genuine product and not just a substitute labeled as Tongkat like many other products. Eurycomanone is considered one of the main active constituents within the Eurycoma plant and studies show it is largely responsible for many of Tongkat Ali's benefits in regards to both libido and bodybuilding benefits. In 2015 "The Journal of Applied Sciences" tested 41 Tongkat Ali extracts from known brands, purchased from Amazon.com, and found over 65% of them were either fake or too weak to be of use. Only buy standardised Tongkat extracts to avoid being scammed! Many of the active compounds found in Tongkat Ali extract are acid sensitive; this means that when consumed as raw powder their oral bioavailability is approximately just 14% or less, and around 33% when administered in a standard capsule. When administered in DRS (Delayed Release System) capsules, the peak bioavailability increases to approximately 52% giving a vastly superior Tongkat Ali product. This is because the capsules have an enteric coating that is resistant to stomach acids, which would normally dissolve the capsule causing the extract within to be released early and any acid sensitive constituents would mostly be wasted, along with your money. Instead, the capsule passes through the stomach unharmed and eventually breaks down and releases the extract where it can be better absorbed by the body. No other Tongkat Ali product uses Delayed release capsules. Click HERE for a video explaining more about DRS. World A.B.S employ an Indonesian based agent who specializes in raw material sourcing, the agent visits several reputable Tongkat Ali growers and chipped root suppliers to inspect the available stock first hand and negotiate prices on their behalf. This flexibility in our supply chain ensures the finest quality Indonesian Tongkat Ali root at a competitive price. DRS Capsules for increased absorbency. 100% Tongkat, NO substitutes or fillers. Produced in Europe according to cGMP standards. 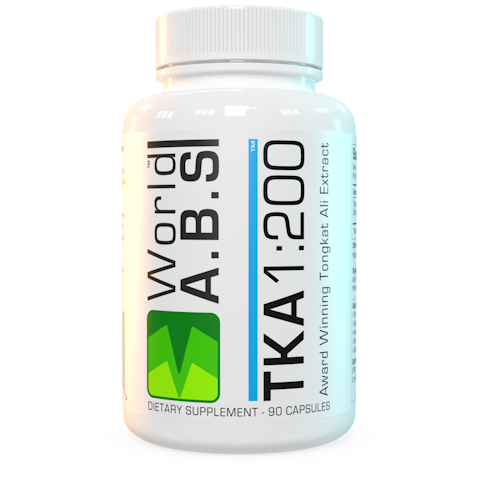 TKA 1:200™ can be used continually for up to 15 weeks, a break period spanning 40% of your chosen on cycle time is recommended, No post cycle therapy is required. LEGAL NOTE: The info above was provided by the manufacturer and has not been evaluated by the FDA or any other medical body, and as such TKA 1:200™ is being sold as a dietary supplement. It is not intended to treat, cure or prevent any condition, illness or disease.